Some people found Umberto Eco’s previous book, The Island of the Day Before (reviewed here), to be boring: the entire book takes place in a single place; there are hardly any characters other than the protagonist, Roberto; and nothing hardly ever happens. 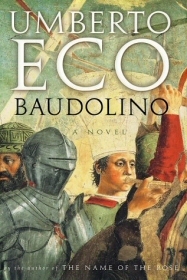 Eco’s new book, Baudolino, is the exact opposite. This story has everything: fencing, fighting, torture, revenge, giants, monsters, chases, escapes, True Love, miracles... It ranges all over the known world (and beyond), and has scores of secondary characters in addition to the main one -- Baudolino. The book takes place in the late 12th/early 13th century. It begins when the Holy and Roman Emperor Frederick I, better known as Frederick Barbarossa, picks up a young boy in the Italian midland and practically adopts him as a son. That young boy is Baudolino, and the book accompanies him as he tells the story of his life to the historian Niketas Choniates. Like Frederick I, and many other characters in the book, Niketas is a real historic character. Baudolino’s life story is interwoven with the real history of the world in a way that sometimes makes it difficult to tell truth from fiction. But it gets better: even in the book’s internal world, the characters often find it difficult to tell truth from fiction. After all, Baudolino himself admits that he is a shameless liar. Eco has written before (e.g., in Six Walks in the Fictional Woods) about the blurry line between the world of fiction and that of reality; here the confusion is twice as strong. Eco had shamelessly put his character into every central decision point in Frederick’s life -- or was it Baudolino that put himself there, when telling his story to Niketas? Baudolino had supposedly caused Bishop Otto to rewrite his historic works (Chronica sive Historia de duabus civitatibus); he is the mastermind behind the Diet of Roncaglia; the anointing of the Antipope; the canonization of Charlemagne; the forged letters of Prester John; and most of all, Frederick’s decision to embark on a third crusade. Baudolino’s own life is spent mostly in a quest to find the Kingdom of Prester John, a legendary Christian kingdom in the orient, and to find the Grasal, better known as the Holy Grail. He is accompanied by several friends, including Abdul (who searches for the princess of his fantasies), Rabbi Solomon (a Jew who believes that the Ten Lost Tribes would be found in Prester John’s kingdom), and the Poet. For the most part, the book could be telling a real aspect of history that was simply never before published. However, as Baudolino reaches the mysterious orient, the story suddenly begins to be as realistic as Arabian Nights -- with one-legged people, headless people, satyrs that are never seen, giants, rocs, and whatnot. So obviously the story cannot be real. But wait -- perhaps the story is real, and Baudolino is simply lying to Niketas? Early during his story, Baudolino tells Niketas that he had killed the man who murdered Frederick. Niketas claims everybody knows that Frederick had drowned, and wasn't murdered, but Baudolino states he knows the real truth behind that death. Was Frederick really murdered? And if so, who was the culprit? The last few chapters read like a murder mystery that would not have shamed Agatha Christie, with a stunning revelation at the end. This murder mystery amidst religious debates, solved by a sharp Holmes-like detective, is a common theme between Baudolino and Eco’s The Name of the Rose. All in all, the book provides for a fascinating, fast-paced reading, in direct contrast with the slow pace of The Island of the Day Before; certainly one of Eco’s best works. Baudolino’s friend, the anonymous Poet, never really wrote a single line of poetry, but he had earned eternal fame for poems written by Baudolino. While you might not find the lyrics familiar (Feror ego veluti -- sine nauta navis, etc. ), I’m sure you'll recognize the music composed for them centuries later, by Carl Orff. It is generally believed that this is the best performance ever recorded.